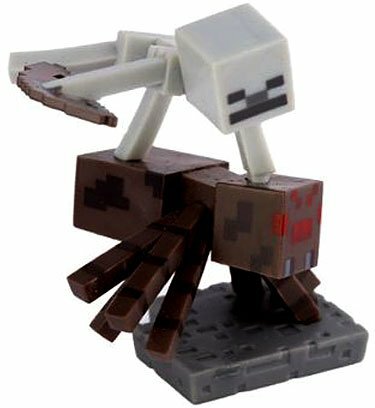 From Minecraft, comes the Series 2 Spider Jockey Pack. 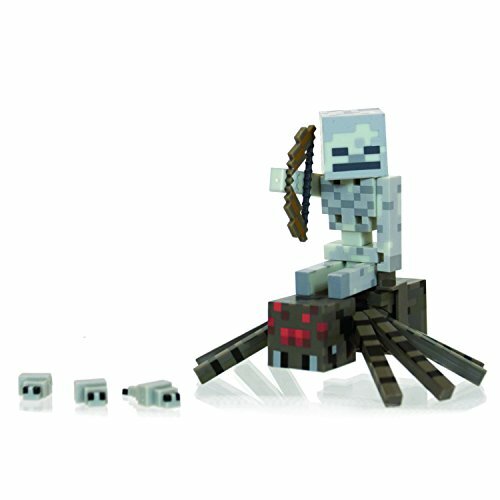 Gear up with the Wither Skeleton, Spider, Bow & Arrow, and 3 Silver Fish as you play out real scenes with the Minecraft Spider Jockey Pack! Dig in to the world of Minecraft like never before with Minecraft Mini-Figure 3-packs! Each 3-pack includes an assortment of figures that bring the game to life in the palm of your hand. Choose from a variety of sets -- all of which feature their signature, in-game appearance and styling. So start exploring the world of Minecraft Mini-Figures and craft the perfect collection! Item includes 3 miniature figures. Colors and decorations may vary. Dig in to the world of Minecraft world like never before with Minecraft Mini-Figure 3-packs! Each 3-pack includes figures that bring the game to life in the palm of your hand. Choose from four different sets in each series -- all of which feature signature, authentic game appearance and styling. Plus, each 3-pack includes one exclusive figure! So start exploring the world of Minecraft Mini-Figures and craft the perfect collection! Item includes three miniature figures. Colors and variations may vary. From the hit video game, Minecraft, take home the Dungeon Pack. Includes Zombie Spawner, Skeleton Spawner, Spider Spawner, Zombie, Skeleton, Spider, Golden Apple, Chest, Iron Ingot, Collect all Series 3 Minecraft action figures! Keep building the fun with an assortment of large-scale Minecraft figures based on characters from the video game. Your favorite Minecraft characters come with exciting game-authentic features and accessories unique to each one. Each figure is articulated and in 5-inch scale. Relive all your favorite moments from the world of Minecraft! Collect them all! Each sold separately, subject to availability. Colors and decorations may vary. 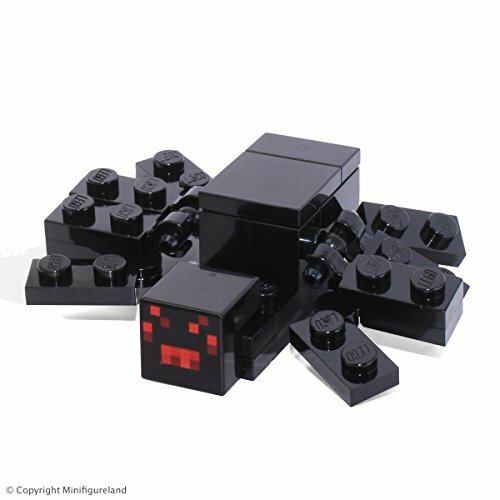 Recreate exciting action scenes from the Minecraft Video Game Series with the Minecraft Spider minifigure. Comes disassembled ready to build. ​Now you can be a Minecraft moviemaker! With the Minecraft Stop-Motion Movie Creator, you’re the director! With your smart phone or tablet and Minecraft “sets,” turn your Minecraft figures into actors and create adventure stories your way. Filmmaking has never been so easy and fun! Inspired by the online community, this authentic playset comes with props and four mini-figures -- two of which are exclusive to this set -- to make your own Minecraft story come to life. Choose from one of four brand new, iconic backgrounds to set the stage and use the mini-figures and accessories to set up your scene. Download the FREE mobile app and animate in three easy steps. Swap out the background cards, props, and environment pieces for endless storytelling. Use the app to create and edit your movies. Includes one movie stage, four different backgrounds, two exclusive mini-figure Exclusive Spider Jockey (with Enchanted Bow) and Exclusive Alex (with Diamond Pickaxe), two additional mini-figures Zombie and Zombie in Flames, props, and a phone/tablet holder. Colors and decorations may vary. 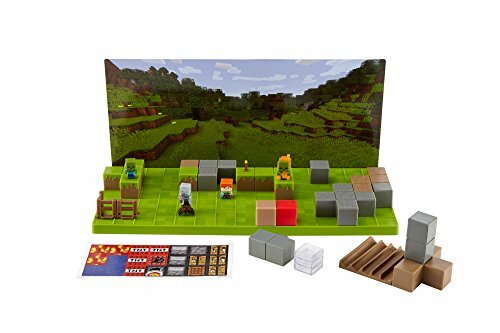 Minecraft Toy Bundle PLAYSET - Mini Figure Environment Sets let you build a bigger Minecraft mini figure world! Each set contains terrain and a function that makes game play with mini figures even more fun. Collect Mining Mountain, Doom Drawbridge, Waterfall Wonder, and Piston Push (each sold separately, subject to availability) and connect them with the uniquely simple click together mechanism. Each playset includes one mini figure. 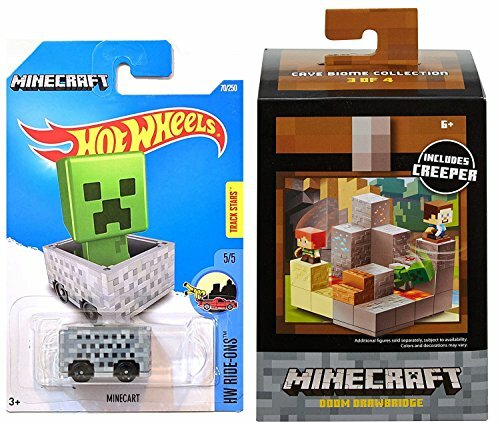 Collect and connect all of the Mini Figure Environment Sets to create a wonderfully expansive Minecraft world of your own!HOT WHEELS Hot Wheels Minecraft Cart. Minecraft Minecart it is the Minecart which the player can ride on in Minecraft. In game, you can have your Minecart hold a chest, furnace, hopper and TNT. 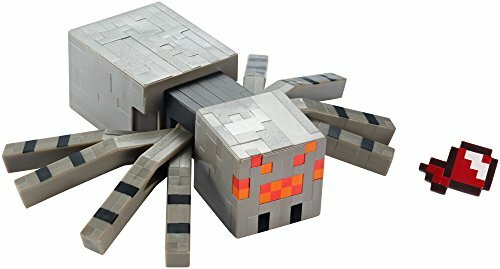 Compare prices on Minecraft Spider Figure at ShoppinGent.com – use promo codes and coupons for best offers and deals. Start smart buying with ShoppinGent.com right now and choose your golden price on every purchase.